Millennials and Homeownership - What's Holding Them Back? Apartment List recently conducted a survey of more than 30,000 renters across the United States, asking questions about their plans for homeownership, affordability, and savings for a down payment. Our research indicates that the vast majority of millennial renters (79%) want to purchase a home, but that affordability is the biggest obstacle that they face. 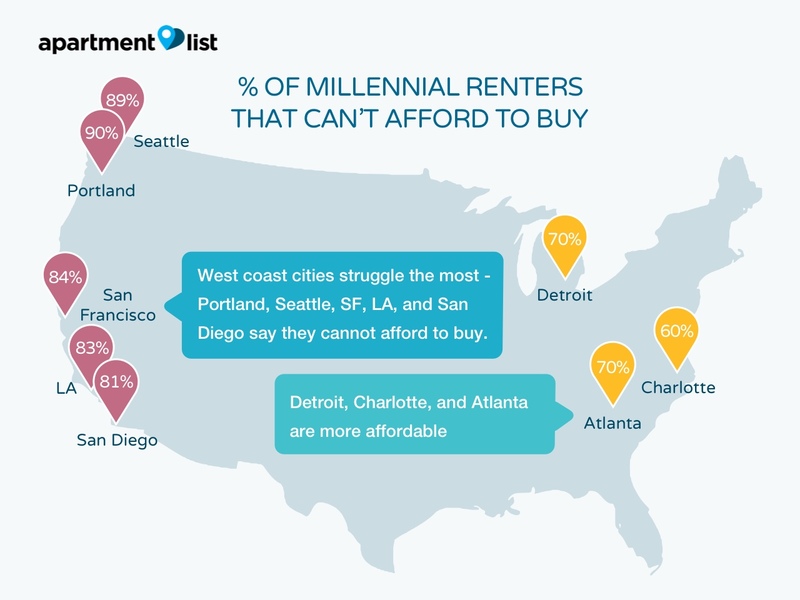 The issue is particularly acute on the west coast: more than 80% of millennials in Portland, Seattle, SF, LA, and San Diego say they cannot afford to buy. 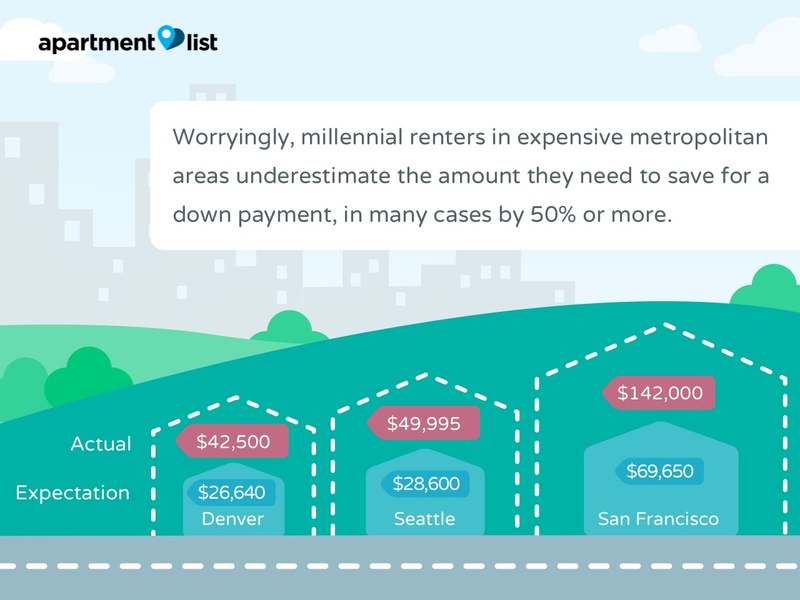 Worryingly, we find that millennial renters in expensive metropolitan areas significantly underestimate the amount they need to save for a down payment, in many cases by 50% or more. Using data on starter home prices and millennials’ average savings rates currently, we estimate that many renters will need a decade or more before they can afford a 20% down payment on a home. Faced with stagnant incomes and rising home prices, many home buyers may have to purchase at increasingly high debt-to-income ratios, heightening the risk of mortgage default. Other millennials may have to migrate to more affordable cities and suburbs, or delay marriage and having children. The US homeownership rate reached 63.4% in the second quarter of 2015, the lowest level in almost fifty years. The homeownership rate is especially low among millennials, and continues to decline each quarter. There are many factors affecting this trend – rising rents, student loans, and delayed marriages, for example – making it difficult to forecast trends in millennial homeownership. Our renter survey last year indicated that most millennial renters still intend to purchase a home, but the majority plan to delay homeownership for three or more years. 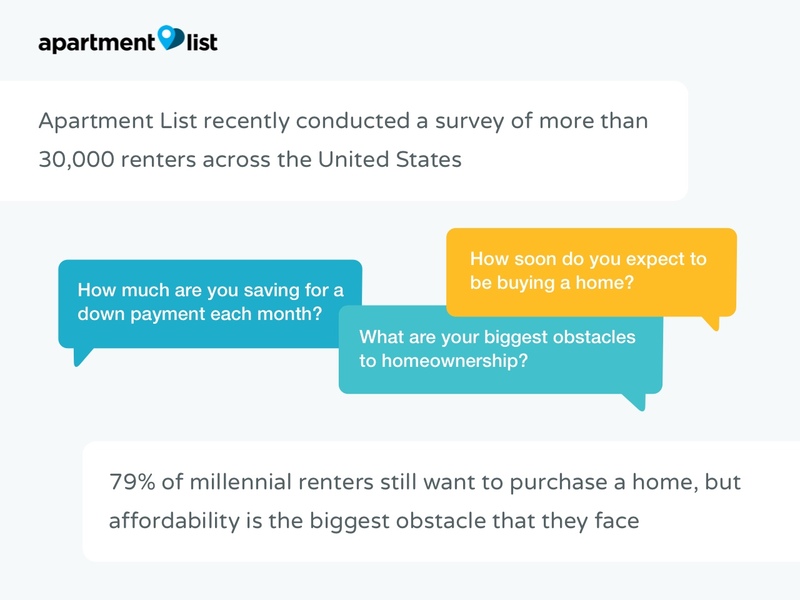 Today, we release the results from our 2016 renter survey1, in which we asked millennials about obstacles to homeownership, savings for a down payment, and more. Our study covers 93 metropolitan areas and 130 cities across the United States – click here to download the data. 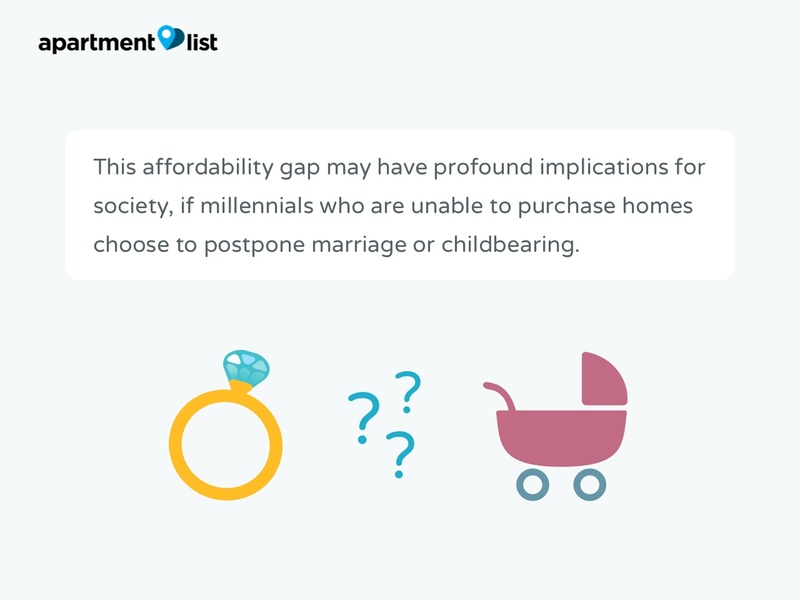 Our research suggests that affordability is the biggest barrier to homeownership, with 77% of millennials stating that it is the reason why they are unable to purchase a home. In contrast, less than 40% of millennial renters say they are delaying homeownership because they are waiting to settle down or be married. Also, even though most millennials plan on purchasing within the next five years, current saving rates indicate that many are likely to need a decade or more to save enough for a down payment. 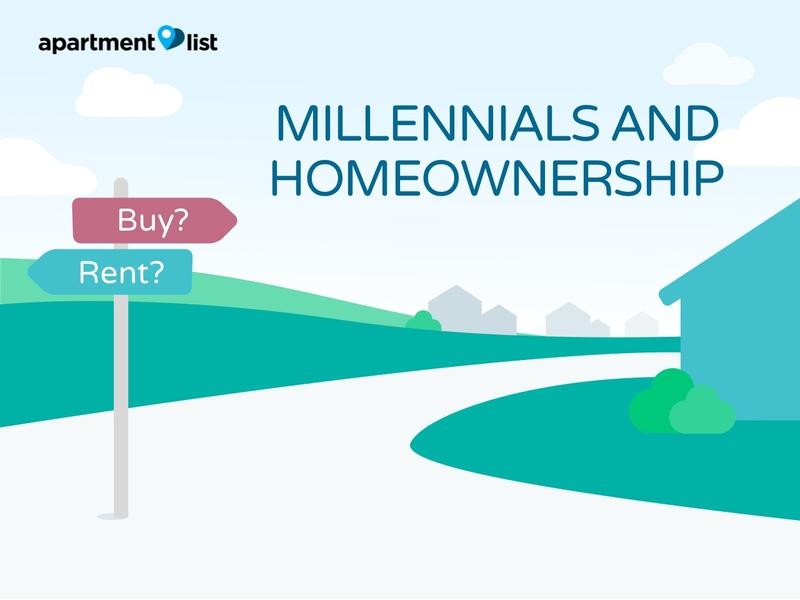 Our data suggests that most millennials still believe in homeownership. 79% plan on eventually purchasing a house or apartment, and another 15% are unsure. Only 6% expect to always rent. When asked about when they plan to buy, however, nearly 80% of renters are delaying their purchase for two or more years. It seems like the millennial homeownership rate will stay depressed for a while longer. Among renters who expect to always rent, affordability was once again the primary obstacle (61% of respondents). 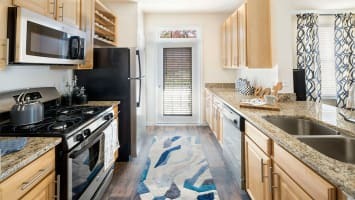 Many millennials do seem to appreciate the convenience of renting, however – 58% rent because of the flexibility, and another 43% prefer to avoid the hassle of maintenance and other costs. Next, we dive into the results in different metropolitan statistical areas across the country. In nearly all the metros we looked at, affordability was the #1 reason for delaying homeownership, but millennials on the west coast struggled the most: Portland, San Diego, Seattle, Los Angeles, and San Francisco all had more than 80% of renters listing affordability as a concern. Miami and New York, expensive metros with many cost-burdened renters, were #6 and #7 on the list. In contrast, even in “transient” cities like San Francisco and New York, less than half of millennials listed marriage or not being ready to settle down as a reason. This suggests that many millennials want to purchase a home sooner, but are unable to afford it. On the other hand, millennials in cities away from the coasts are are less concerned about affordability. Detroit (64%), Charlotte (68%) and Atlanta (68%) take the top spots, with Houston and Dallas also performing relatively well. 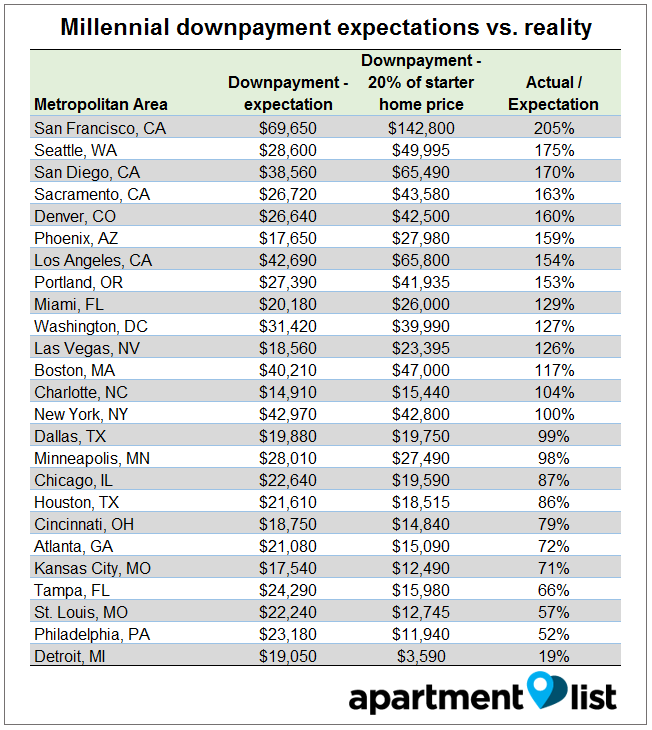 Even in these cities, however, affordability is still the biggest concern, by a large margin. The results varied widely across metropolitan areas. Millennials in the Bay Area have the most unrealistic expectations, with the average renter there underestimating their down payment amount by more than $73,000. Other expensive metros with fast-rising home prices had similar results – for example, Seattle, Sacramento, and Denver have all seen home price increases of more than 10% in the past year, and millennial expectations may not have caught up. The majority of renters state that they plan on settling down in the same city4, but some millennials may end up moving to more affordable locations when they find out the true cost of their down payment. On the other side of the spectrum, millennials in Detroit, Philadelphia, and St. Louis expect are planning on saving more for a down payment than may be necessary – perhaps because they are planning on purchasing a nicer home. The starter home price in the Detroit area is $17,950, but a house in a safer neighborhood with better schools could cost quite a bit more. In Kansas City, MO, renters are planning on saving an extra ~$5,000, which could take an additional year or two, but could mean a larger home with better amenities. Looking at the data, 37% of millennial renters have not saved anything for a down payment, and more than 41% are not saving each month. Even among older millennials, the picture is not much better: more than 70% are saving less than $200 each month, even in expensive cities like Boston or Los Angeles. Interestingly, 74% of millennials do not expect to receive any help for their down payment; only 6% expect to receive $10,000 or more in financial support. 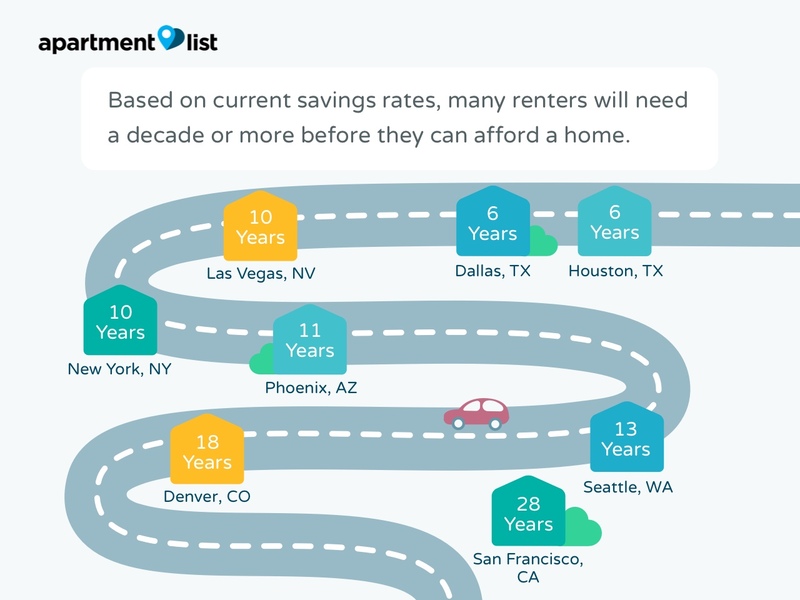 Looking at the results, San Francisco came in dead last – millennial renters there need ~28 years to save enough for a 20% down payment on a home! 68% of renters in the Bay Area plan on settling down there, but unless they strike it rich with an IPO, a home may be out of reach. 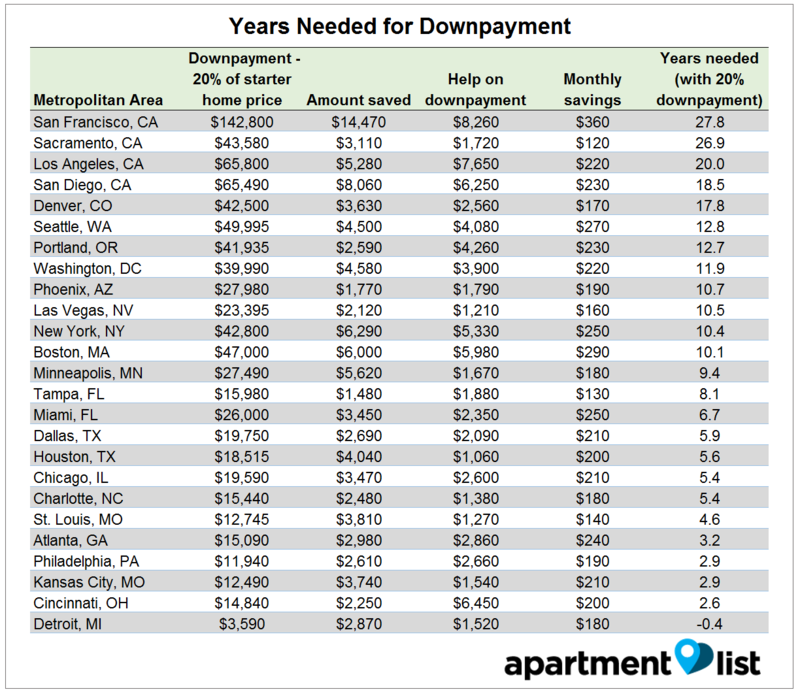 Even with a 5% down payment, millennials in San Francisco will still need 7 years to afford a down payment. Overall, California cities performed poorly, taking the worst four spots. Millennials in 12 of the metros above need more than a decade to save enough for a home. The savings period might be reduced if millennials find a partner, but many millennials in their thirties will likely also want to start a family, which could reduce the amount they save as well. On other other side of the spectrum, Detroit was the most affordable area – in fact, many millennial renters there have already saved enough for a home. Cities in the Midwest and the South generally performed well, with many cities requiring six years or less to save enough for a down payment. What happens when millennials can’t afford to buy? The past decade has seen large numbers of millennials move to San Francisco, Denver, Seattle, and other expensive cities along or near the coast, driving up rents and home prices. Worryingly, many do not seem to realize their financial predicament – three in four renters plan to purchase a home within the next five years, but their savings trajectories suggest that they may need a decade or more to afford it. Fortunately, the picture looks better in other parts of the country, which means that homeownership may still be within reach for those living in these parts, or who are willing to relocate out of the pricey cities. In the coming years an unprecedented scene will unfold: many millennial renters in expensive areas want to settle down there, but what will they do when they realize they can’t afford it? Some will choose to purchase with a smaller down payment (the FHA loan program only requires a 3.5% down payment, for example), saddling themselves with higher fees and risk. Others will delay settling down and having children, or migrate to family-friendly cities on the interior of the country. Given the size of the millennial population, any of these scenarios will have a profound impact on homeownership and renting in our society. 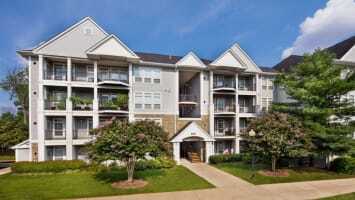 The Apartment List renter survey was conducted from November 2015 to February 2016, and sent to renters searching for an apartment on our website. A full copy of the survey is available upon request. Because survey respondents were allowed to select more than one reason, the answers sum to more than 100%. We estimated actual down payment costs as 20% of starter home prices, using Trulia data. Millennials may get by with a smaller down payment (10% or even 5%), but will often need to get private mortgage insurance, increasing their monthly costs. For example, 70% of millennial renters living in NYC plan on settling down there, and results are similar in Boston (69%), SF (68%), LA (65%) and Chicago (59%). A full analysis of those variables is beyond the scope of this article, but with median renter wages being flat and home prices rising quickly in many areas, it seems quite possible that millennials would take even longer to save for a home. Investing in the S&P might help, but most renters plan on purchasing within 5 years, and it is difficult to predict what kind of return they might get within a relatively short time period.